Clean. Simple. Green. A brand new division of WAC Lighting, Modern Forms is a future-forward collection of vanity and outdoor lighting meant to blend in with a fresh aesthetic of today's interiors. 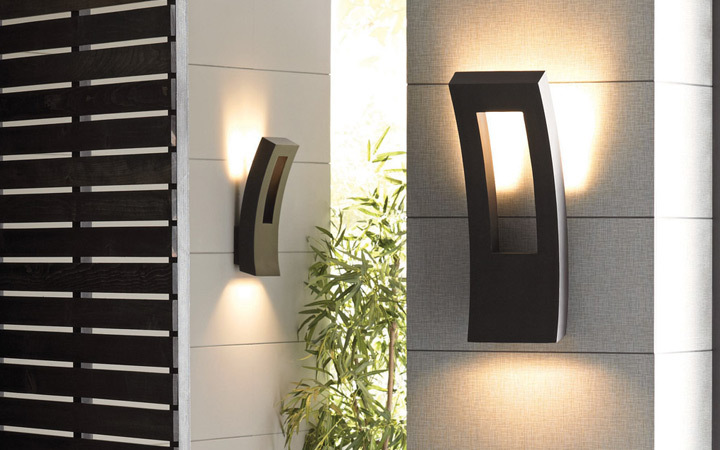 Modern Forms Dawn Indoor/Outdoor LED Wall Sconce reworks the classic wall sconce into an architectural work of art. Dawn's unique geometric shape appears to curve slightly away from the wall. With energy efficient LEDs, Dawn casts dynamic back and downlight, adding a dramatic effect to both exterior and interior spaces. Satisfying many design fans' appetite for innovation, Modern Forms Forq Indoor/Outdoor LED Wall Sconce provides a bold, contemporary style for both interior and exterior spaces. Recreating the iconic fork shape into a robust sculture, Forq features an aluminum body and matching square wall plate. With energy efficient LEDs encased in glass diffusers, Forq casts a wash of illumination. The Modern Forms Jedi Indoor/Outdoor LED Wall Sconce is energy-efficient LED lighting fit for the Galactic Republic, and Force approved. 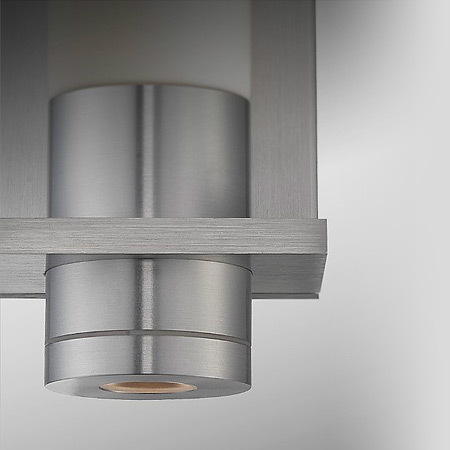 A light sabre-like shade of Etched Opal glass, featuring a twist lock for clean lines and easy removal, casts a strong ambient glow while a tucked away down light directs a beam of illumination down the wall, serving as a neat accent. A light should be more than just a light, and Modern Forms from WAC Lighting is just that. This new line of vanity and outdoor fixtures takes advantage of the most up-to-date technology and ensures that function isn't sacrificed for form (though, the form certainly has something going for it, too). We posed a few questions to Modern Forms mastermind Shelley Wald to learn more about the collection. The Modern Forms like focuses on fixtures for the bath and outdoors—was that intentional? We wanted the brand to bring exemplary, innovative lighting technology to modern spaces. Right now, we thought the bath and outdoor spaces best allowed us to do this, since the requirements for bath lighting are heavily focused on brightness and color quality. For outdoor, our wet-rated sconces gave us the chance to demonstrate a variety of creative, original design that can now be made possible with LEDs. Why was it important to exclusively use LEDs? We wanted the LED sources of the MF fixtures to be customized to each design. Most LED lights out there are designed just to supplement incandescent collections, using the same design just with an LED. Here, we designed with flexibility of the light source in mind, and that allows us to do things that wouldn't work with just any off-the-shelf light source. For example, the Neo LED Bath Bar uses LED flat panel technology that creates phenomenal light output from a fixture that's just a half-inch deep. And the LED lights paired with the 13th century style Piastra glass used in the Vetri Bath Bar creates a truly spectacular illuminating experience. When it comes to modern design, we want something novel but lasting. LED designs are really the answer to that, providing energy-sipping, maintenance free, quality light for years to come. And this collection is accessible for just that, without an upcharge for a technology upgrade down the road. Is there a certain taste or style you picture Modern Forms going with best? These luminaires are intentionally simplified and understated, designed to complement any architecture or interior design scheme, rather than define it with embellishment. It was important that we created something upscale that truly integrated new technologies, and I think the core design tenets and engineering of these fixtures will be self evident in each space they illuminate. Do you have a favorite MF fixture? For the bath, the Vetri Bath Bar; Forq for my favorite indoor sconce.